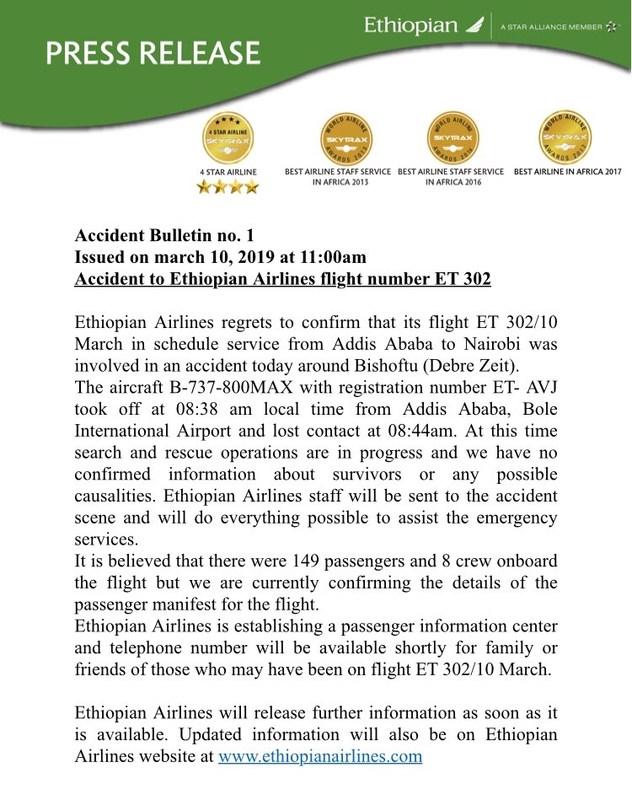 A brand new Ethiopian Airlines Boeing 737 MAX 8 passenger jet has crashed on a flight from Addis Ababa to Nairobi. "Ethiopian Airlines staff will be sent to the accident scene and will do everything possible to assist the emergency services," the airline added. First word of the crash came on Prime Minister Abiy Ahmed's Twitter account. He tweeted his "deepest condolences to the families of those that have lost their loved ones". The plane was delivered to the airline just four months ago. Edited by Yamapi, 10 March 2019 - 05:36 PM. These countries, got possibility of terrorism. Boeing 737 MAX 8 know to have a software defect that will cause the aeroplane to nose dive. Hope this is not the case , otherwise all 737 max 8 have to be grounded until Boeing provide some level of assurance. I just had an idea. Maybe my MIL would like to see an African safari. If she get there in one piece maybe she can feed the lions herself? Be careful u keep on writing these what if ur MIL saw this post and decided to poison ur meal tonight? If u fly around this region, u can't avoid the 737 max 8. Almost all our neighbours carriers bought it. Even silkair. Really hope they figure out the prelim cause and ground them if necessary. The Max is used for certain longer range routes, e.g. silkair deploys the Max for flights to Hiroshima, for example. Took a flight to a regional destination recently and they used the plain old 737-800. "'Captain wanted to return' The CEO of Ethiopian Airlines Tewolde Gebremariam is speaking at a press conference. He said the captain of the crashed plane had told controllers at Bole airport that he was having difficulty and wanted to return, and that he had been given clearance." Is the Boeing 737-800 same as the 737 Max 8?